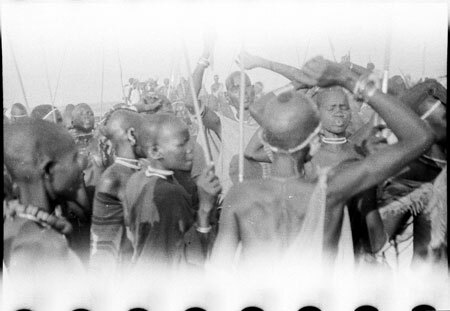 A close view of a crowd of people with hands raised in a gesture mimicking ox horns, at a dry season cattle camp dance. One of the arms raised is wearing thiau armrings on the right arm. Morton, Chris. "A Nuer dance" Southern Sudan Project (in development). 03 Jan. 2006. Pitt Rivers Museum. <http://southernsudan.prm.ox.ac.uk/details/2004.130.32949.1/>.